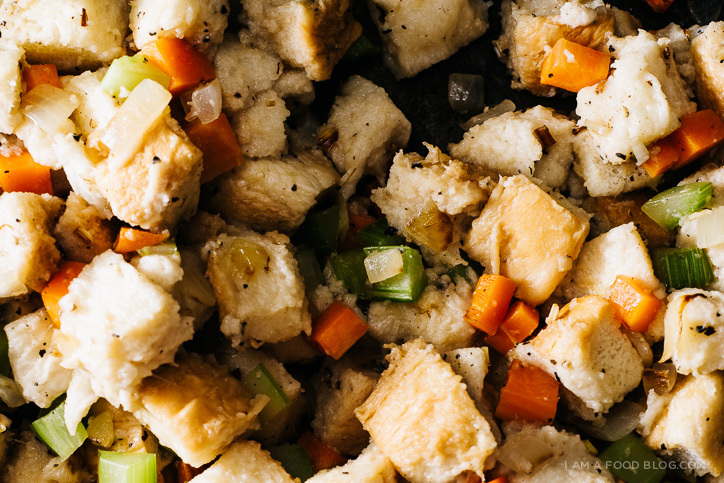 Seems like there’s a great divide on stuffing vs. dressing. Technically, this isn’t stuffing because it hasn’t been stuffed inside a bird (hard to do when you just braise a leg) but regardless, I like my stuffing unstuffed and baked up in a dish so the top can get all crunchy while the bottom stays nice and tender. 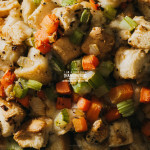 Much like the great divide between stuffing and dressing, most people fall into the love it or hate it category of stuffing. I didn’t grow up eating the stuff (ha!) so I don’t have any fond childhood memories of it, but I really, really love it. I was a teenager when I first had stuffing and it only happened because my brother went out and bought box of Stove Top. The number one reason that I didn’t have stuffing before then is because of my mom. She isn’t a fan of a lot of foods, (cinnamon, stuffing, lamb) so as kids, Kevin and I didn’t really get the chance to try a lot of common non-Chinese dishes. To wit: our childhood version of stuffing for turkey dinner was a Chinese sausage sticky rice affair. As kids, Kevin and I would beg for stuffing, but my mom basically told us it was disgusting and there was no way she’d ever make it. I’m sure I would have gotten around to eating stuffing one day, but I’m glad that Kevin just decided to take matters into his own hands. Stove Top isn’t the greatest, but it was love at first bite, at least for us kids. To this day my mom and dad don’t like stuffing. I think I’ve been mildly brainwashed by my mom because I’m actually always surprised when people like stuffing. A couple of years ago I had a Friendsgiving and I was pleasantly startled when the stuffing was the first dish to be polished off. This lemongrass stuffing is pretty simple. Usually I’ll throw some bacon or sausage into my stuffing, but I kept it (somewhat) classic here: mirepoix (onions, carrots, celery) with plenty of finely minced lemongrass for a bit of depth. I toasted up some leftover Japanese style white bread as the base, but usually I like a sturdier loaf that’ll soak up liquid and bake well. It’s funny because stuffing is in no ways a nostalgic food for me, but when I eat it I feel incredibly cozy. How about you guys? 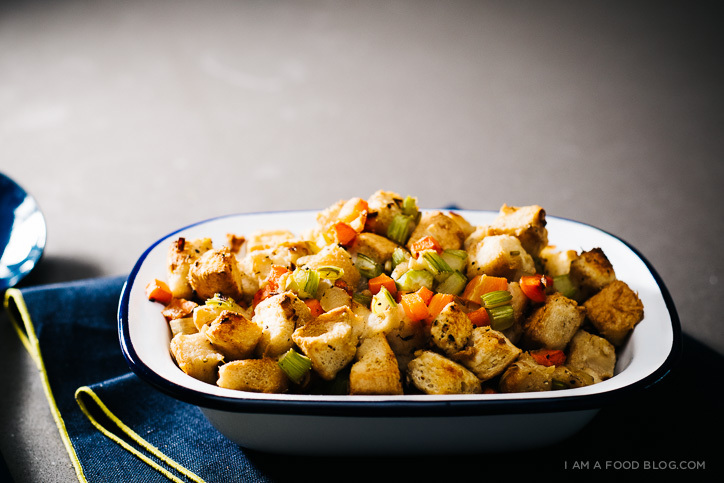 Does stuffing (dressing) make you feel all warm and cosy? Did you grow up eating it? Arrange the cubes of bread on a rimmed baking sheet and toast until pale golden brown and dry, about 10-12 minutes. Set aside and let cool. In a skillet, melt the butter over medium heat. 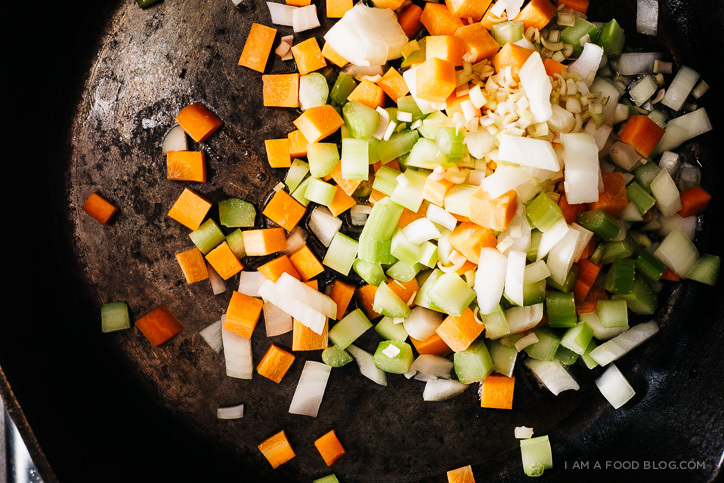 Add the onions, celery, carrots, and lemongrass and cook until soft, 7-8 minutes. 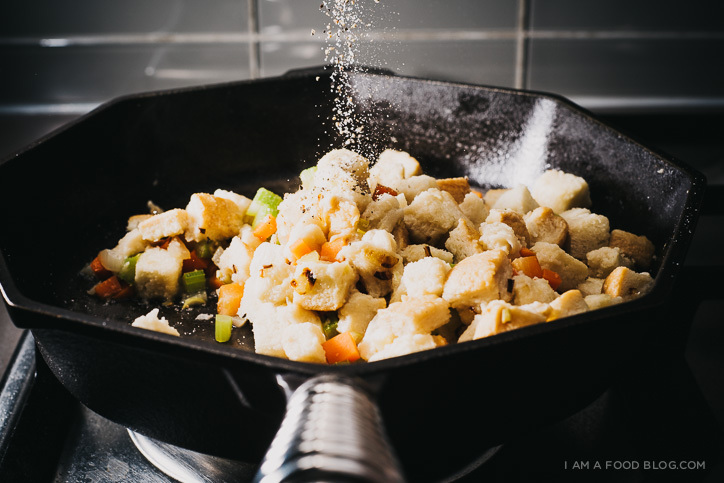 Toss the cooked vegetables with the toasted bread cubes until combined. Taste and season with salt and freshly ground pepper. Add the chicken stock slowly while tossing gently. Bake the stuffing in a small oven-proof container, uncovered, until golden brown and crisp on top, about 30 minutes. Enjoy hot. It’s an I am a Food Blog Thanksgiving! I made a tiny Thanksgiving for two featuring some Asian flavors. Rounding out the meal are lemongrass braised turkey legs, and miso mashed potatoes. Next up are going to be honey garlic sprouts! Ok first, this is the second time this month that I’ve seen that cast iron skillet, and I really, really want one :) Second, this stuffing looks amaze. Such a simple addition to switch up flavors! We have fresh lemongrass from our CSA share – now I know how to use it. My mom has always made the most fabulous stuffing – on the holiday table, I’m always torn between mashed potatoes and stuffing as my favorite. That whole plate you’ve pictured at the end has me salivating! 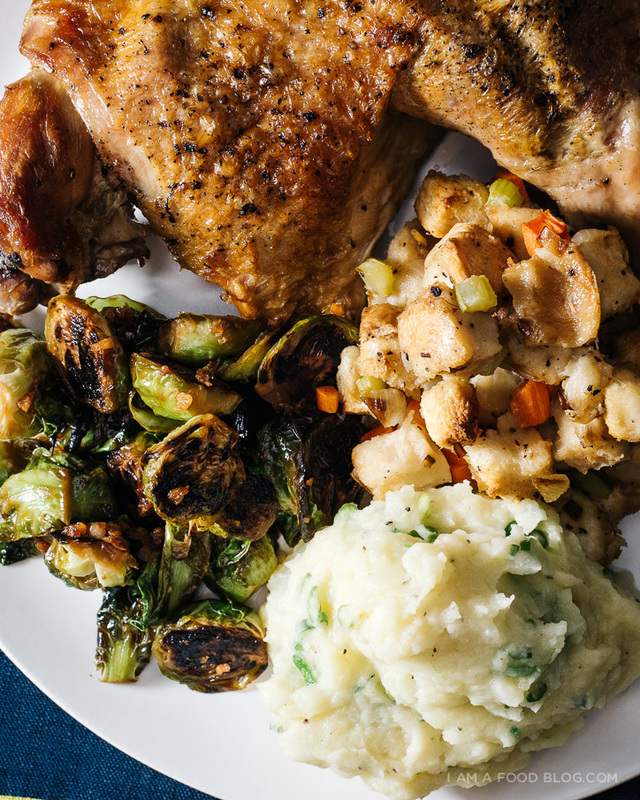 I’m with you on preferring non-stuffed stuffing – the crispy edges are the best. I have everything in the house now to try this recipe (yay!) – I think I’ll make it for brunch on Saturday and top it with a fried egg. This sounds great! I grew up hating stuffing, because it was mushy and gross. I started loving it, when I had my mother-in-laws recipe, when my husband and I first started dating! Stuffing is the best. THE BEST. Way better than things like green bean casserole and cranberry sauce. I could eat stuffing all day! I love the idea of mixing it up with lemongrass – super intriguing. This looks so tasty! I cannot wait for Thanksgiving this year. Better start hitting the gym in preparation. I never ate stuffing as I really wasn’t a fan, but I recently tried some chestnut, apricot pork stuffing balls which were amazing! I think British stuffing is different – it’s not really bready, more meaty and stuck together with breadcrumbs?! I have always loved stuffing it is just so delicious. I can eat stuffing for the rest of my life if I could. I never had made it myself I definitly have to try this it looks very tasty and delicious. 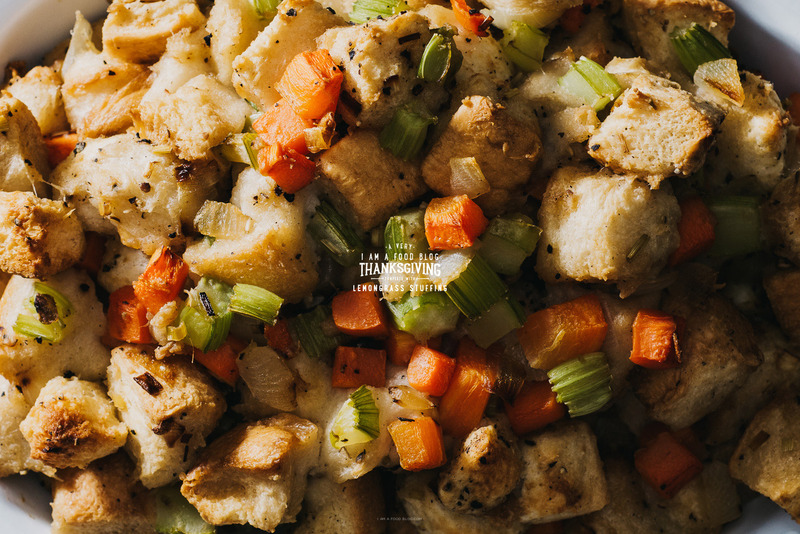 My mom has always made the best stuffing I have to tell her about this recipe or maybe just try it myself for once. It’s already thanksgiving so hope you have a great one with your family. God bless!! !